"Military of China" redirects here. For military of the Republic of China (Taiwan), see Republic of China Armed Forces. For other uses, see Military of China (disambiguation). For other uses, see People's Liberation Army (disambiguation). The People's Liberation Army (PLA; Script error) is the military of the People's Republic of China (PRC) and was established on August 1, 1927 as the Chinese Workers and Peasants Red Army. August 1 is celebrated annually as PLA Day. The modern PLA consists of four professional service branches: the People's Liberation Army Ground Force, the People's Liberation Army Navy, the People's Liberation Army Air Force and the Second Artillery Corps. It is the world's largest military force, with a strength of approximately 2,285,000 personnel, about 0.18% of the country's population. The People's Liberation Army's insignia consists of a roundel with a red star bearing the Chinese characters for Eight One, referring to August 1 (Script error), the date of the 1927 Nanchang Uprising. The PLA is formally under the command of the Central Military Commission of the CPC; there is also an identical commission in the government, but it has no clear independent functions. The Ministry of National Defense, which operates under the State Council, does not exercise any authority over the PLA and is far less powerful than the Central Military Commission (CMC). The ministry assures continuing CPC control over the armed forces, and its primary role is that of a liaison office with foreign militaries. The political and military leadership have made a concerted effort to create a professional military force restricted to national defense and to the provision of assistance in domestic economic construction and emergency relief. This conception of the role of the PLA requires the promotion of specialized officers who can understand modern weaponry and handle combined arms operations. Troops around the country are stationed in seven military regions and more than 20 military districts. Military service is compulsory by law, however, a draft in China has never been enforced due to large numbers of volunteers from China's population. In times of national emergency the People's Armed Police and the People's Liberation Army Milita act as a reserve and support element for the PLA, primarily for the People's Liberation Army Ground Force. The People's Liberation Army was founded on 1 August 1927 during the Nanchang Uprising when troops of the Kuomintang (KMT) rebelled under the leadership of Zhu De, He Long, Ye Jianying and Zhou Enlai shortly after the end of the first Kuomintang–Communist alliance. They were then known as the Chinese Workers' and Peasants' Red Army (Script error), or simply the Red Army. Between 1934 and 1935, the Red Army survived several campaigns led against it by Generalissimo Chiang Kai-Shek and engaged in the Long March. During the Second Sino-Japanese War from 1937 to 1945, the Communist military forces were nominally integrated into the National Revolutionary Army of the Republic of China forming the Eighth Route Army and the New Fourth Army units. During this time, these two military groups primarily used guerrilla warfare, fought a few battles with the Japanese while consolidating their ground by annexing nationalist troops and paramilitary forces behind the Japanese lines. After the end of the Sino-Japanese War, the Communist Party merged the two military groups and renamed the multi-million strong force the "People's Liberation Army" and eventually won the Chinese Civil War. A number of military regions were established in 1949. On 11 November 1949, the Air Force leadership structure was established and the Navy leadership the following April. In 1950, the leadership structures of the artillery, armored troops, air defense troops, public security forces, and worker–soldier militias were also established. The chemical warfare defense forces, the railroad forces, the communications forces, and the second artillery, as well as other forces, were established later. During the 1950s, the PLA with Soviet help transformed itself from a peasant army into a modern one. Part of this process was the reorganisation that created thirteen military regions in 1955. The PLA also contained many National Revolutionary Army units and Generals who had defected to the PLA. Ma Hongbin and his son Ma Dunjing (1906-1972) were the only two Muslim Generals who led a Muslim unit, the 81st corps to ever serve in the PLA. Han Youwen, a Salar Muslim General, also defected to the PLA. In November 1950, the PLA or People's Volunteer Army intervened in the Korean War as United Nations forces under General Douglas MacArthur approached the Yalu River. Under the weight of this offensive, Chinese forces drove MacArthur's forces out of North Korea and captured Seoul, but were subsequently pushed back south of Pyongyang north of the 38th Parallel. That war also served as a catalyst for the rapid modernization of the PLAAF. In 1962, the PLA also fought India in the Sino-Indian War successfully neutralizing Indian defenses and achieving all objectives. Prior to the Cultural Revolution, military region commanders tended to remain in post for long periods. As the PLA took a stronger role in politics, this began to be seen as something of a threat to party (or, at least, civilian) control of the gun. The longest serving military region commanders were Xu Shiyou in the Nanjing Military Region (1954–74), Yang Dezhi in the Jinan Military Region (1958–74), Chen Xilian in the Shenyang Military Region (1959–73), and Han Xianchu in the Fuzhou Military Region (1960–74). Establishment of a professional military force equipped with modern weapons and doctrine was the last of the Four Modernizations announced by Zhou Enlai and supported by Deng Xiaoping. In keeping with Deng's mandate to reform, the PLA has demobilized millions of men and women since 1978 and has introduced modern methods in such areas as recruitment and manpower, strategy, and education and training. In 1979, the PLA fought Vietnam over a border skirmish in the Sino-Vietnamese War where it was reported by Western media that China lost more than 20,000 soldiers. Both sides claimed victory. During the Sino-Soviet split, strained relations between China and Soviet Russia resulted in bloody border clashes and mutual backing for the opponents enemies. China and Afghanistan had neutral relations with each other during the King's rule. When the pro Soviet Afghan Communists seized power in Afghanistan in 1978, relations between China and the Afghan communists quickly turned hostile. The Afghan pro Soviet communists supported China's enemies in Vietnam and blamed China for supporting Afghan anti communist militants. China responded to the Soviet invasion of Afghanistan by supporting the Afghan Mujahidin and ramping up their military presence near Afghanistan in Xinjiang. China acquired military equipment from America to defend itself from Soviet attack. The People's Liberation Army trained and supported the Afghan Mujahidin during the Soviet war in Afghanistan. China moved its training camps for the mujahideen from Pakistan into China itself. Hundreds of millions worth of anti aircraft missiles, rocket launchers and machine guns were given to the Mujahidin by the Chinese. Chinese military advisors and army troops were present with the Mujahidin during training. In the 1980s, China shrunk its military considerably to free up resources for economic development, resulting in the relative decline in resources devoted to the PLA. Following the PLA's suppression of the Tiananmen Square protests of 1989, ideological correctness was temporarily revived as the dominant theme in Chinese military affairs. Reform and modernization have today resumed their position as the PLA's priority objectives, although the armed forces' political loyalty to the CPC has remained a leading concern. Another area of concern to the political leadership was the PLA's involvement in civilian economic activities. These activities were thought to have impacted PLA readiness and has led the political leadership to attempt to divest the PLA from its non-military business interests. Beginning in the 1980s, the PLA tried to transform itself from a land-based power, centred on a vast ground force, to a smaller, mobile, high-tech one capable of mounting operations beyond its borders. The motivation for this was that a massive land invasion by Russia was no longer seen as a major threat, and the new threats to China are seen to be a declaration of independence by Taiwan, possibly with assistance from the United States, or a confrontation over the Spratly Islands. In 1985, under the leadership of the Central Committee of the Communist Party of China and the CMC, the PLA changed from being constantly prepared to "hit early, strike hard and to fight a nuclear war" to developing the military in an era of peace. The PLA reoriented itself to modernization, improving its fighting ability, and to become a world-class force. Deng Xiaoping stressed that the PLA needed to focus more on quality rather than on quantity. The decision of the Chinese government in 1985 to reduce the size of the military by one million was completed by 1987. Staffing in military leadership was cut by about 50 percent. During the Ninth Five Year Plan (1996–2000) the PLA was reduced by a further 500,000. The PLA had also been expected to be reduced by another 200,000 by 2005. The PLA has focused on increasing mechanization and informatization so as to be able to fight a high-intensity war. Former CMC Chairman Jiang Zemin in 1990 called on the military to "meet political standards, be militarily competent, have a good working style, adhere strictly to discipline, and provide vigorous logistic support" (Script error). The 1991 Gulf War provided the Chinese leadership with a stark realization that the PLA was an over-sized, obsolescent force. The possibility of a militarized Japan has also been a continuous concern to the Chinese leadership since the late 1990s. In addition, China's military leadership has been reacting to and learning from the successes and failures of the American military during the Kosovo War, the 2001 invasion of Afghanistan, the 2003 invasion of Iraq, and the Iraqi insurgency. All these lessons inspired China to transform the PLA from a military based on quantity to one based on quality. Chairman Jiang Zemin officially made a "Revolution in Military Affairs" (RMA) part of the official national military strategy in 1993 in order to modernize the Chinese armed forces. A goal of the RMA is to transform the PLA into a force capable of winning what it calls "local wars under high-tech conditions" rather than a massive, numbers-dominated ground-type war. The Chinese military planners call for short decisive campaigns, limited in both their geographic scope and their political goals. In contrast to the past, more attention is given to reconnaissance, mobility, and deep reach. This new vision has shifted resources towards the navy and air force. The PLA is also actively preparing for space warfare and cyber-warfare. For the past 10 to 20 years, the PLA has acquired some advanced weapons systems from Russia, including Sovremenny class destroyers, Sukhoi Su-27 and Sukhoi Su-30 aircraft, and Kilo-class diesel-electric submarines. It has also completed several new destroyers and frigates including 2 AAW Type 052C class guided missile destroyers. In addition, the PLAAF has built an indigenous J-10 fighter aircraft. The PLA launched the new Jin class nuclear submarines on 3 December 2004 capable of launching nuclear warheads that could strike targets across the Pacific Ocean. In August 2010, PLA Daily suggested that Chinese military strategy was out of date, and that China must "audaciously learn from the experience of the information cultures of foreign militaries". 1927-1950: Chinese Civil War against the Kuomintang (KMT) as the Chinese Red Army. 1937-1945: Second Sino-Japanese War, from 1941 part of World War II against the Empire of Japan. 1949: Yangtze incident (the battle against British warships on the Yangtze river). 1950-1953: Korean War (Under the banner of the Chinese People's Volunteer Army). 1954-1955: First Taiwan Strait Crisis. 1958: Second Taiwan Strait Crisis at Quemoy and Matsu. 1967: Border skirmishes with India. 1974: Battle of the Paracel Islands with Vietnam. 1988: Johnson South Reef Skirmish with Vietnam. 1989: Enforcement of martial law in Beijing during the Tiananmen Square protests of 1989. 1995-1996: Third Taiwan Strait Crisis. 2014: Officers of Unit 61398 are indicted by a grand jury in the United States on criminal charges. The state military system upholds the principle of the CPC's absolute leadership over the armed forces. The party and the State jointly established the CMC that carries out the task of supreme military leadership over the armed forces. The 1954 Constitution stated that the State President directs the armed forces and made the State President the chair of the Defense Commission (the Defense Commission is an advisory body, it does not lead the armed forces). On 28 September 1954, the Central Committee of the Chinese Communist Party re-established the CMC as the leader of the PLA and the armed forces. From that time onwards, the system of joint system of party and state military leadership was established. The Central Committee of the Communist Party leads in all military affairs. The State President directs the state military forces and the development of the military forces managed by the State Council. In order to ensure the absolute leadership of the Communist Party over the armed forces, every level of party committee in the military forces implements the principles of democratic centralism, the divisions and higher levels establish political commissars and political organizations, and ensures that the branch organizations are in line. These systems melded the party organization with the military organization in order to achieve the party's leadership and administrative leadership. This is the key guarantee to the absolute leadership of the party over the military. The leadership by the CPC is a fundamental principle of the Chinese military command system. The PLA reports not to the State Council but rather to two Central Military Commissions, one belonging to the state and one belonging to the party. In practice, the two central military commissions do not conflict each other because their membership is usually identical. Often, the only difference in membership between the two occurs for a few months every five years, during the period between a party congress, when Party CMC membership changes, and the next ensuing National People's Congress, when the state CMC changes. The CMC carries out its responsibilities according to the authority given to it by the Constitution and National Defense Law. The leadership of each type of military force is under the leadership and management of the corresponding part of the Central Military Commission of the Chinese Communist Party Central Committee. Forces under each military branch or force such as the subordinate forces, academies and schools, scientific research and engineering institutions, logistical support organizations, are also under the leadership of the CMC. This arrangement has been especially useful as China over the past several decades has moved increasingly towards military organizations composed of forces from more than one military branch. In September 1982, in order to meet the needs of modernization and to improve coordination in the command of forces including multiple service branches and to strengthen unified command of the military, the CMC ordered that the leadership organization of the various military branches be abolished. The PLA now has air force, navy and second artillery leadership organs. In 1986, the People's Armed Forces Department, except in some border regions, was placed under the joint leadership of the PLA and the local authorities. Although the local party organizations paid close attention to the People's Armed Forces Department, as a result of some practical problems, the CMC decided that after 1 April 1996, the People's Armed Forces Department will be once again be under the PLA. China's former Minister of National Defense Gen. Liang Guanglie answers a question during a joint press conference with U.S. Secretary of Defense Leon Panetta in 2012. According to the Constitution of the People's Republic of China, the CMC is composed of the following: the Chairman; the Vice-Chairmen; and Members. The Chairman of the Central Military Commission has overall responsibility for the commission. In December 1982, the fifth National People's Congress revised the state constitution to provide that the State Central Military Commission leads all the armed forces of the state. The chair of the State CMC is chosen and removed by the full NPC while the other members are chosen by the NPC standing committee. However, the CMC of the Central Committee of the Chinese Communist Party remained the party organization that directly leads the military and all the other armed forces. In actual practice, the party CMC, after consultation with the democratic parties, proposes the names of the State CMC members of the NPC so that these people after going through the legal processes can be elected by the NPC to the State Central Military Commission. That is to say, that the CMC of the Central Committee and the CMC of the State are one group and one organization. However, looking at it organizationally, these two CMCs are subordinate to two different systems – the party system and the State system. Therefore the armed forces are under the absolute leadership of the Communist Party and are also the armed forces of the state. This is unique joint leadership system reflects the origin of the PLA as the military branch of the Communist Party. It only became the national military when the People's Republic was established in 1949. By convention, the chairman and vice-chairman of the Central Military Commission are civilian members of the Communist Party of China, but they are not necessarily the heads of the civilian government. Both Jiang Zemin and Deng Xiaoping retained the office of chairman even after relinquishing their other positions. All of the other members of the CMC are uniformed active military officials. Unlike other nations, the Minister of National Defense is not the head of the military, but is usually a vice chairman of the CMC. In 2012, in order to attempt to reduce the corruption at the highest levels of the Chinese military, the commission banned the service of alcohol at military receptions. General Armaments Department (GAD) (sometimes translated as General Equipment Department). The GPD maintains a system of political commissars which maintain a separate chain of command to ensure loyalty to the party and the civilian government. The CMC exercises leadership over the military regions, the Navy and the Air Force and the Second Artillery through the four general departments. The PLA garrisons in Hong Kong and Macau are both under the administration of the Guangzhou MR. Coordination with civilian national security groups such as the Ministry of Foreign Affairs is achieved primarily by the leading groups of the Communist Party of China. Particularly important are the leading groups on foreign affairs and Taiwan. The PLA is planning to reduce the number of military regions from seven to five "military areas" to have joint command with ground, naval, air, and second artillery corps forces. This is planned to change their concept of operations from primarily ground-oriented to mobile and coordinated movement of all services. The coastal Jinan, Nanjing, and Guangzhou regions will be retained and turned into military areas and the four other inland military regions will be streamlined into two military areas mainly for organizing forces for operations. The change will occur over the next five years. The PLA encompasses four main service branches: the Ground Force, the Navy, the Air Force and the Second Artillery Corps. Following the 200,000 troop reduction announced in 2003, the total personnel strength of the PLA has been reduced from 2.5 million to just under 2.3 million. Further reforms will see an additional 300,000 personnel reduction from its current strength of 2.28 million personnel. The reductions will come mainly from non-combat ground forces, which will allow more funds to be diverted to naval, air, and strategic missile forces. This shows China's shift from ground force prioritization to emphasizing air and naval power with high-tech equipment for offensive roles over disputed coastal territories. In recent years, the PLA has paid close attention to the performance of the US armed forces in Afghanistan and Iraq. As well as learning from the success of the US military in network-centric warfare, joint operations, C4ISR, and hi-tech weaponry, the PLA is also studying the unconventional tactics that could be used to exploit the vulnerabilities of a more technologically advanced enemy. This has been reflected in the two parallel guidelines for the PLA ground forces development. While speeding up the process of introducing new technology into the force and retiring the older equipment, the PLA has also placed an emphasis on asymmetric warfare, including finding methods of using existing equipment to defeat a technologically superior enemy. In addition to the four main service branches, the PLA is supported by two paramilitary organisations: the People's Armed Police and the People's Liberation Army Milita. A Type 99 Main battle tank in service with the PLAGF. The PLA deploys the world's largest ground force, currently totaling some 1.6 million personnel, or about 60 percent of the PLA's total manpower (2.3 million). The ground forces are divided among the seven military regions as named above. In times of crisis, the PLA Ground Force will be reinforced by numerous reserve and paramilitary units. The PLAGF reserve component has about 510,000 personnel divided into 30 infantry, and 12 anti-aircraft artillery (AAA) divisions. Two amphibious mechanized divisions were also created in Nanjing and Guangzhou MR. At least 40 percent of PLA divisions and brigades are now mechanized or armored, almost double the percentage before the reduction. While much of the PLA Ground Force was being reduced over the past few years, technology-intensive elements such as special operations forces (SOF), army aviation (helicopters), surface-to-air missiles (SAMs), and electronic warfare units have all been rapidly expanded. The latest operational doctrine of the PLA ground forces highlights the importance of information technology, electronic and information warfare, and long-range precision strikes in future warfare. The older generation telephone/radio-based command, control, and communications (C3) systems are being replaced by an integrated battlefield information networks featuring local/wide-area networks (LAN/WAN), satellite communications, unmanned aerial vehicle (UAV)-based surveillance and reconnaissance systems, and mobile command and control centers. Until the early 1990s, the navy performed a subordinate role to the PLA Land Forces. Since then it has undergone rapid modernization. The 255,000 strong People's Liberation Army Navy (PLAN) is organized into three major fleets: the North Sea Fleet headquartered at Qingdao, the East Sea Fleet headquartered at Ningbo, and the South Sea Fleet headquartered in Zhanjiang. Each fleet consists of a number of surface ship, submarine, naval air force, coastal defense, and marine units. The navy includes a 10,000 strong Marine Corps (organised into two brigades), a 26,000 Naval Air Force operating several hundred helicopters and fixed-wing aircraft, plus a 25,000 strong Coastal Defense Force. As part of its overall program of naval modernization, the PLAN has been developing a blue water navy. The Navy also utilises the CJ-10 naval cruise missile system, which made its first public appearance during late 2009. A Chengdu J-20 5th generation stealth fighter currently under development for the PLAAF. The People's Liberation Army Air Force is organized into seven Military Region Air Forces (MRAF) and 24 Air Divisions. The largest operational units within the Aviation Corps is the air division, which has 2 to 3 aviation regiments, each with 20 to 36 aircraft. The surface-to-air missile (SAM) Corps is organized into SAM divisions and brigades. There are also three airborne divisions manned by the PLAAF. The Second Artillery Corps (SAC) is the strategic missile forces of the PLA. It controls China's nuclear and conventional strategic missiles. China's total nuclear arsenal size is estimated to be between 100 and 400 nuclear weapons. The SAC has approximately 100,000 personnel and six ballistic missile divisions (missile corps bases). The six divisions are independently deployed in different military regions and have a total of 15 to 20 missile brigades. Article 55 of the Constitution of the People's Republic of China prescribes conscription by stating: "It is a sacred duty of every citizen of the People's Republic of China to defend his or her motherland and resist invasion. It is an honoured obligation of the citizens of the People's Republic of China to perform military service and to join the militia forces." As of 2014[update] the 1984 Military Service Law spells out the legal basis of conscription, describing military service as a duty for "all citizens without distinction of race... and religious creed". This law has not been amended since it came into effect. Conscription has only existed officially since the establishment of the People's Republic in 1949, and, theoretically, all Chinese citizens have had the duty of performing military service. Technically, those 18–22 years of age enter selective compulsory military service, with a 24-month service obligation. This includes 18–19 years of age for female high-school graduates who meet requirements for specific military jobs. Military service is normally performed in the regular armed forces, but the 1984 law does allow for conscription into the reserve forces. Residents of the Hong Kong and Macau SAR however, as of 1997 and 1999 are exempted from joining the military. In 2011, CMC Chairman Hu admitted that China is lagging in the development of military talent and ordered the PLA, military colleges and academies to cultivate talents. This article does not contain any citations or references. Please improve this article by adding a reference. For information about how to add references, see Template:Citation. The General Staff Department carries out staff and operational functions for the PLA and had major responsibility for implementing military modernization plans. Headed by chief of general staff, the department served as the headquarters for the ground forces and contained directorates for the three other armed services: Air Force, Navy, and Strategic Missile Force. The General Staff Department included functionally organized subdepartments for artillery, armored units, engineering, operations, training, intelligence, mobilization, surveying, communications, quartermaster services, and politics. Navy Headquarters controlled the North Sea Fleet, East Sea Fleet, and South Sea Fleet. Air Force Headquarters generally exercised control through the commanders of the seven military regions. Nuclear forces were directly subordinate to the General Staff Department. Conventional main, regional, and militia units were controlled administratively by the military region commanders, but the General Staff Department in Beijing could assume direct operational control of any main-force unit at will. Thus, broadly speaking, the General Staff Department exercises operational control of the main forces, and the military region commanders controlled the regional forces and, indirectly, the militia. The post of principal intelligence official in the top leadership of the Chinese military has been taken up by a number of people of several generations, from Li Kenong in the 1950s to Xiong Guangkai in the late 1990s; and their public capacity has always been assistant to the deputy chief of staff or assistant to the chief of staff. Ever since the CPC officially established the system of "major military regions" for its army in the 1950s, the intelligence agencies inside the Army have, after going through several major evolutions, developed into the present three major military intelligence setups. The central level is composed of the Second and Third Departments under the PLA General Staff Headquarters and the Liaison Department under the PLA General Political Department. At the major military regions intelligence activities consist of the Second Bureau established at the same level as the Operation Department under the headquarters, and the Liaison Department established under the Political Department. The third system includes a number of communications stations directly established in the garrison areas of all the major military regions by the Third Department of the PLA General Staff Headquarters. The Second Bureau under the headquarters and the Liaison Department under the Political Department of major military regions are only subjected to the "professional leadership" of their "counterpart" units under the Central Military Commission and are still considered the direct subordinate units of the major military region organizationally. Those entities whose names include the word "institute", all research institutes under the charge of the Second and the Third Departments of the PLA General Staff Headquarters, including other research organs inside the Army, are at least of the establishment size of the full regimental level. Among the deputy commanders or deputy chiefs of staff of a major military region in China, there is always one who is assigned to take charge of intelligence work, and the intelligence agencies under his charge are directly affiliated to the headquarters and the political department of the military region. Efforts must be made to strengthen understanding of the special nature and role of intelligence work, as well as understanding of the close relationship between strengthening intelligence work on the one hand, and of the Four Modernizations of the motherland, the reunification of the motherland, and opposition to hegemony and power politics on the other. The United States and the West have all along been engaged in infiltration, intervention, sabotage, and intelligence gathering against China on the political, economic, military, and ideological fronts. The response must strengthen the struggle against their infiltration, intervention, sabotage, and intelligence gathering. Consolidating intelligence departments and training a new generation of intelligence personnel who are politically reliable, honest and upright in their ways, and capable of mastering professional skills, the art of struggle, and advanced technologies. Strengthening the work of organizing intelligence in two international industrial, commercial, and financial ports—Hong Kong and Macau. Although the four aspects emphasized by Chi Haotian appeared to be defensive measures, they were in fact both defensive and offensive in nature. The Second Department of the PLA General Staff Headquarters is responsible for collecting military intelligence. Activities include military attachés at Chinese embassies abroad, clandestine special agents sent to foreign countries to collect military information, and the analysis of information publicly published in foreign countries. The Second Department oversees military human intelligence (HUMINT) collection, widely exploits open source (OSINT) materials, fuses HUMINT, signals intelligence (SIGINT), and imagery intelligence data, and disseminates finished intelligence products to the CMC and other consumers. Preliminary fusion is carried out by the Second Department's Analysis Bureau which mans the National Watch Center, the focal point for national-level indications and warning. In-depth analysis is carried out by regional bureaus. Although traditionally the Second Department of the General Staff Department was responsible for military intelligence, it is beginning to increasingly focus on scientific and technological intelligence in the military field, following the example of Russian agencies in stepping up the work of collecting scientific and technological information. The research institute under the Second Department of the General Staff Headquarters is publicly known as the Institute for International Strategic Studies; its internal classified publication "Foreign Military Trends" (Wai Jun Dongtai) (外军动态) is published every 10 days and transmitted to units at the division level. The PLA Institute of International Relations at Nanjing comes under the Second Department of the General Staff Department and is responsible for training military attachés, assistant military attaches and associate military attaches as well as secret agents to be posted abroad. It also supplies officers to the military intelligence sections of various military regions and group armies. The Institute was formed from the PLA "793" Foreign Language Institute, which moved from Zhangjiakou after the Cultural Revolution and split into two institutions at Luoyang and Nanjing. The Institute of International Relations was known in the 1950s as the School for Foreign Language Cadres of the Central Military Commission, with the current name being used since 1964. The training of intelligence personnel is one of several activities at the Institute. While all graduates of the Moscow Institute of International Relations were employed by the KGB, only some graduates of the Beijing Institute of International Relations are employed by the Ministry of State Security. The former Institute of International Relations, since been renamed the Foreign Affairs College, is under the administration of the Ministry of Foreign Affairs and is not involved in secret intelligence work. The former Central Military Commission foreign language school had foreign faculty members who were either Communist Party sympathizers or were members of foreign communist parties. But the present Institute of International Relations does not hire foreign teachers, to avoid the danger that its students might be recognized when sent abroad as clandestine agents. Those engaged in professional work in military academies under the Second Department of the PLA General Staff Headquarters usually have a chance to go abroad, either for advanced studies or as military officers working in the military attaché's office of Chinese embassies in foreign countries. People working in the military attaché's office of embassies are usually engaged in collecting military information under the cover of "military diplomacy". As long as they refrain from directly subversive activities, they are considered as well-behaved "military diplomats". Some bureaus under the Second Department which are responsible for espionage in different regions, of which the First Bureau is responsible for collecting information in Taiwan, Hong Kong and Macau. Agents are dispatched by the Second Department to companies and other local corporations to gain cover. Finding out and keeping abreast of the political leanings of officials of the Hong Kong and Macau governments, as well as their views on major issues, through social contact with them and through information provided by them. Keeping abreast of the developments of foreign governments' political organs in Hong Kong, as well as of foreign financial, industrial, and commercial organizations. Finding out and having a good grasp of the local media's sources of information on political, military, economic, and other developments on the mainland, and deliberately releasing false political or military information to the media to test the outside response. The "Autumn Orchid" intelligence group was awarded a Citation for Merit, Second Class, in December 1994. It was further awarded another Citation for Merit, Second Class, in 1997. Its current status is not publicly known. During the 2008 Chinese New Year celebration CCTV held for Chinese diplomatic establishments, the head of the Second Department of the PLA General Staff Headquarters was revealed for the first time to the public: the current head was Major General Yang Hui (杨晖), the former deputy head of the Third Department of the PLA General Staff Headquarters (he was a senior colonel when he held that position). The Third Department of the General Staff Headquarters is responsible for monitoring the telecommunications of foreign armies and producing finished intelligence based on the military information collected. The communications stations established by the Third Department of the PLA General Staff Headquarters are not subject to the jurisdiction of the provincial military district and the major military region of where they are based. The communications stations are entirely the agencies of the Third Department of the PLA General Staff Headquarters which have no affiliations to the provincial military district and the military region of where they are based. The personnel composition, budgets, and establishment of these communications stations are entirely under the jurisdiction of the Third Department of the General PLA General Staff Headquarters, and are not related at all with local troops. China maintains the most extensive SIGINT network of all the countries in the Asia-Pacific region. As of the late 1990s, SIGINT systems included several dozen ground stations, half a dozen ships, truck-mounted systems, and airborne systems. Third Department headquarters is in the vicinity of the GSD First Department (Operations Department), AMS, and NDU complex in the hills northwest of the Summer Palace. As of the late 1990s, the Third Department was allegedly manned by approximately 20,000 personnel, with most of their linguists trained at the Luoyang Institute of Foreign Languages. Ever since the 1950s, the Second and Third Departments of the PLA General Staff Headquarters have established a number of institutions of secondary and higher learning for bringing up "special talents." The PLA Foreign Language Institute at Luoyang comes under the Third Department of the General Staff Department and is responsible for training foreign language officers for the monitoring of foreign military intelligence. The Institute was formed from the PLA "793" Foreign Language Institute, which moved from Zhangjiakou after the Cultural Revolution and split into two institutions at Luoyang and Nanjing. Though the distribution order they received upon graduation indicated the "PLA General Staff Headquarters", many of the graduates of these schools found themselves being sent to all parts of the country, including remote and uninhabited backward mountain areas. The reason is that the monitoring and control stations under the Third Department of the PLA General Staff Headquarters are scattered in every corner of the country. The communications stations located in the Shenzhen base of the PLA Hong Kong Garrison started their work long ago. In normal times, these two communications stations report directly to the Central Military Commission and the PLA General Staff Headquarters. Units responsible for coordination are the communications stations established in the garrison provinces of the military regions by the Third Department of the PLA General Staff Headquarters. By taking direct command of military communications stations based in all parts of the country, the CPC Central Military Commission and the PLA General Staff Headquarters can not only ensure a successful interception of enemy radio communications, but can also make sure that none of the wire or wireless communications and contacts among major military regions can escape the detection of these communications stations, thus effectively attaining the goal of imposing a direct supervision and control over all major military regions, all provincial military districts, and all group armies. China's main SIGINT effort is in the Third Department of the General Staff Department of the Central Military Commission, with additional capabilities, primarily domestic, in the Ministry of State Security (MSS). SIGINT stations, therefore, are scattered through the country, for domestic as well as international interception. Prof. Desmond Ball, of the Australian National University, described the largest stations as the main Technical Department SIGINT net control station on the northwest outskirts of Beijing, and the large complex near Lake Kinghathu in the extreme northeast corner of China. As opposed to other major powers, China focuses its SIGINT activities on its region rather than the world. Ball wrote, in the eighties, that China had several dozen SIGINT stations aimed at Russia, Japan, Taiwan, Southeast Asia and India, as well as internally. Of the stations apparently targeting Russia, there are sites at Jilemutu and Jixi in the northeast, and at Erlian and Hami near the Mongolian border. Two Russian-facing sites in Xinjiang, at Qitai and Korla may be operated jointly with resources from the US CIA's Office of SIGINT Operations, probably focused on missile and space activity. Other stations aimed at South and Southeast Asia are on a net controlled by Chengdu, Sichuan. There is a large facility at Dayi, and, according to Ball, "numerous" small posts along the Indian border. Other significant facilities are located near Shenyang, near Jinan and in Nanjing and Shanghai. Additional stations are in the Fujian and Guangdong military districts opposite Taiwan. On Hainan Island, near Vietnam, there is a naval SIGINT facility that monitors the South China sea, and a ground station targeting US and Russian satellites. China also has ship and aircraft platforms in this area, under the South Sea Fleet headquarters at Zhanjiang immediately north of the island. Targeting here seems to have an ELINT as well as COMINT flavor. There are also truck-mounted mobile ground systems, as well as ship, aircraft, and limited satellite capability. There are at least 10 intelligence-gathering auxiliary vessels. As of the late nineties, the Chinese did not appear to be trying to monitor the United States Pacific Command to the same extent as does Russia. In future, this had depended, in part, on the status of Taiwan. The Fourth Department (ECM and Radar) of the General Staff Headquarters Department has the electronic intelligence (ELINT) portfolio within the PLA's SIGINT apparatus. This department is responsible for electronic countermeasures, requiring them to collect and maintain data bases on electronic signals. 25 ELINT receivers are the responsibility of the Southwest Institute of Electronic Equipment (SWIEE). Among the wide range of SWIEE ELINT products is a new KZ900 airborne ELINT pod. The GSD 54th Research Institute supports the ECM Department in development of digital ELINT signal processors to analyze parameters of radar pulses. The PLA General Political Department (GPD) maintains the CPC structure that exists at every level of the PLA. It is responsible for overseeing the political education, indoctrination and discipline that is a prerequisite for advancement within the PLA. The GPD controls the internal prison system of the PLA. The International Liaison Department of the General Political Department is publicly known as the "China Association for International Friendly Contacts". The department prepares political and economic information for the reference of the Political Bureau. The department conducts ideological and political work on foreign armies, explaining China's policies, and disintegrate enemy armies by dampening their morale. It is also tasked with instigating rebellions and disloyalty within the Taiwan military and other foreign militaries. The Liaison Office has dispatched agents to infiltrate Chinese-funded companies and private institutions in Hong Kong. Their mission is counter-espionage, monitoring their own agents, and preventing and detecting foreign intelligence services buying off Chinese personnel. China's special ground force is called CPLASF (China People Liberation Army Special Forces). It includes harshly trained soldiers, a team of commander, assistant commander, sniper, spotter, machine-gun supporter, bomber, and a pair of assault group. China's counterterrorist unit is drawn from the police force rather than the military. The name changes frequently, but as of this writing, it is known as the Immediate Action Unit (IAU). The Chinese Army fields large number of special operations groups and would appear to have a vast pool of manpower to choose from. However, it is believed that any significant terrorist activity within Chinese borders would draw the attention of the IAU. The Third Department and the Navy cooperate on shipborne intelligence collection platforms. PLAAF Sixth Research Institute: Air Force SIGINT collection is managed by the PLAAF Sixth Research Institute in Beijing. According to the United States Defense Department, China is developing kinetic-energy weapons, high-powered lasers, high-powered microwave weapons, particle-beam weapons, and electromagnetic pulse weapons with its increase of military fundings. The PLA has said of reports that its modernization is dependent on sales of advanced technology from American allies "Some people have politicized China's normal commercial cooperation with foreign countries, smearing our reputation." These contributions include advanced European diesel engines for Chinese warships, military helicopter designs from Eurocopter, French anti-submarine sonars and helicopters, Australian technology for the Houbei class missile boat, and Israeli supplied American missile, laser and aircraft technology. There is a belief in the western military doctrines that the PLA have already begun engaging countries using cyber-warfare. There has been a significant increase in the number of presumed Chinese military initiated cyber events from 1999 to the present day. Cyberwarfare has gained recognition as a valuable technique because it is an asymmetric technique that is a part of Chinese Information Operations. As is written by two PLA Colonels, Qiao Liang and Wang Xiangsui, "Methods that are not characterized by the use of the force of arms, nor by the use of military power, nor even by the presence of casualties and bloodshed, are just as likely to facilitate the successful realization of the war's goals, if not more so. While China has long been suspected of cyber spying, on 24 May 2011 the PLA announced the existence of their cyber security squad. In February 2013, the media named "Comment Crew" as a hacker military faction for China's People's Liberation Army. In May 2014 a Federal Grand Jury in the United States indicted five Unit 61398 officers on criminal charges related to cyber attacks on private companies. In 1955, China decided to proceed with a nuclear weapons program. The decision was made after the United States threatened the use of nuclear weapons against China should it take action against Quemoy and Matsu, coupled with the lack of interest of the Soviet Union for using its nuclear weapons in defense of China. After their first nuclear test (China claims minimal Soviet assistance before 1960) on 16 October 1964, China was the first state to pledge no-first-use of nuclear weapons. On 1 July 1966, the Second Artillery Corps, as named by Premier Zhou Enlai, was formed. In 1967, China tested a fully functional hydrogen bomb, only 32 months after China had made its first fission device. China thus produced the shortest fission-to-fusion development known in history. China became a major international arms exporter during the 1980s. Beijing joined the Middle East arms control talks, which began in July 1991 to establish global guidelines for conventional arms transfers, and later announced that it would no longer participate because of the U.S. decision to sell 150 F-16A/B aircraft to Taiwan on 2 September 1992. It joined the International Atomic Energy Agency (IAEA) in 1984 and pledged to abstain from further atmospheric testing of nuclear weapons in 1986. China acceded to the nuclear Non-Proliferation Treaty (NPT) in 1992 and supported its indefinite and unconditional extension in 1995. Nuclear weapons tests by China ceased in 1996, when it signed the Comprehensive Test Ban Treaty and agreed to seek an international ban on the production of fissile nuclear weapons material. In 1996, China committed to provide assistance to unsafeguarded nuclear facilities. China attended the May 1997 meeting of the NPT Exporters (Zangger) Committee as an observer and became a full member in October 1997. The Zangger Committee is a group which meets to list items that should be subject to IAEA inspections if exported by countries, which have, as China has, signed the Non-Proliferation Treaty. In September 1997, China issued detailed nuclear export control regulations. China began implementing regulations establishing controls over nuclear-related dual-use items in 1998. China also has decided not to engage in new nuclear cooperation with Iran (even under safeguards), and will complete existing cooperation, which is not of proliferation concern, within a relatively short period. Based on significant, tangible progress with China on nuclear nonproliferation, President Clinton in 1998 took steps to bring into force the 1985 U.S.–China Agreement on Peaceful Nuclear Cooperation. Beijing has deployed a modest ballistic missile force, including land and sea-based intermediate-range and intercontinental ballistic missiles (ICBMs). It was estimated in 2007 that China has about 100-160 liquid fueled ICBMs capable of striking the United States with approximately 100–150 IRBMs able to strike Russia or Eastern Europe, as well as several hundred tactical SRBMs with ranges between 300 and 600 km. 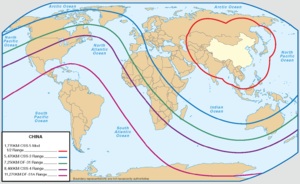 Currently, the Chinese nuclear stockpile is estimated to be between 50 and 75 land and sea based ICBM's. China's nuclear program follows a doctrine of minimal deterrence, which involves having the minimum force needed to deter an aggressor from launching a first strike. The current efforts of China appear to be aimed at maintaining a survivable nuclear force by, for example, using solid-fueled ICBMs in silos rather than liquid-fueled missiles. China's 2006 published deterrence policy states that they will "uphold the principles of counterattack in self-defense and limited development of nuclear weapons", but "has never entered, and will never enter into a nuclear arms race with any country". It goes on to describe that China will never undertake a first strike, or use nuclear weapons against a non-nuclear state or zone. US strategists, however, suggest that the Chinese position may be ambiguous, and nuclear weapons may be used both to deter conventional strikes/invasions on the Chinese mainland, or as an international political tool - limiting the extent to which other nations can coerce China politically, an inherent, often inadvertent phenomenon in international relations as regards any state with nuclear capabilities. The PLA has deployed a number of space-based systems for military purposes, including the imagery intelligence satellite systems like the ZiYan series, and the militarily designated JianBing series, synthetic aperture satellites (SAR) such as JianBing-5, BeiDou satellite navigation network, and secured communication satellites with FENGHUO-1. The PLA is responsible for the Chinese space program. To date, all the participants have been selected from members of the PLA Air Force. China became the third country in the world to have sent a man into space by its own means with the flight of Yang Liwei aboard the Shenzhou 5 spacecraft on 15 October 2003 and the flight of Fei Junlong and Nie Haisheng aboard Shenzhou 6 on 12 October 2005 and Zhai Zhigang, Liu Boming, and Jing Haipeng aboard Shenzhou 7 on 25 September 2008. The PLA has started the development of an anti-ballistic and anti-satellite system in the 1960s, code named Project 640, including ground based lasers, and anti-satellite missiles. On 11 January 2007 China conducted a successful test of an anti-satellite missile, with an SC-19 class KKV. Its anti ballistic missile test was also successful. The PLA has tested two types of hypersonic space vehicles, the Shenglong Spaceplane and a new one built by Chengdu Aircraft Corporation. Military spending in the People's Liberation Army has grown about 10 percent annually over the last 15 years. China's military budget for 2014 according to IHS Jane's, a defense industry consulting and analysis company, will be $148 billion US, which is the second largest in the world. The United States military budget for 2014 in comparison, is $574.9 billion US., which is down from a high of $664.3 billion US in 2012. China's rise in military spending come at a time when there are tensions along the South China Sea with territorial disputes involving the Philippines, Vietnam, and Taiwan, as well as escalating tensions between China and Japan involving the disputed Diaoyu (Chinese spelling) and Senkaku (Japanese spelling) islands. Former-United States Secretary of Defense Robert Gates has urged China to be more transparent about its military capabilities and intentions and Chinese state media has agreed that there is a need to "communicate more often and more effectively" about the issue. The International Institute for Strategic Studies in a 2011 report argued that if spending trends continue China will achieve military equality with the United States in 15–20 years. PLA Factory No. 6907, Wuhan. The white characters on the blue sign roughly translate to: "Secret/Classified Area, Do Not Enter Unless Invited." Until the mid-1990s the PLA had extensive commercial enterprise holdings in non-military areas, particularly real estate. Almost all of these holdings were supposedly spun off in the mid-1990s. In most cases, the management of the companies remained unchanged, with the PLA officers running the companies simply retiring from the PLA to run the newly formed private holding companies. James C. Mulvenon, Andrew N. D. Yang. The People's Liberation Army as Organization Reference Volume v1.0, RAND. Chinese Military Power Council on Foreign Relations Press, May 2003. Roy Kamphausen, Andrew Scobell. Right Sizing the People's Liberation Army Exploring the Contours of China's Military. The Strategic Studies Institute of the US Army War College, September 2007. Chinese Intelligence Agencies Intelligence Resource Program, Federation of American Scientists. International Institute for Strategic Studies; Hackett, James (ed.) (2010-02-03). The Military Balance 2010. London: Routledge. ISBN 1-85743-557-5. Mandated by the FY2000 National Defense Authorization Act, this annual report discusses China's military and security strategies, technological advancements in its capabilities, military doctrine, and security issues in the Taiwan Strait. The Military Power of the People's Republic of China Annual Report to Congress 2004, Office of the Secretary of Defense. The Military Power of the People's Republic of China Annual Report to Congress 2005, Office of the Secretary of Defense. The Military Power of the People's Republic of China Annual Report to Congress 2006, Office of the Secretary of Defense. The Military Power of the People's Republic of China Annual Report to Congress 2007, Office of the Secretary of Defense. The Military Power of the People's Republic of China Annual Report to Congress 2009, Office of the Secretary of Defense. The Military Power of the People's Republic of China Annual Report to Congress 2010, Office of the Secretary of Defense. The Military Power of the People's Republic of China Annual Report to Congress 2011, Office of the Secretary of Defense. The Military Power of the People's Republic of China Annual Report to Congress 2012, Office of the Secretary of Defense. The Military Power of the People's Republic of China Annual Report to Congress 2013, Office of the Secretary of Defense. Andy Bunk Forgotten A look at the changing roles of the Chinese militia system in the Communist era from its inception to the present. Scott Cooper China's Path to Power Capability guidance, net assessments and strategic policy development. Wikimedia Commons has media related to People's Liberation Army. China Defence Today SinoDefence.com | Leading online source of information and news on China's military power and defence industry, including weapon systems, organisations, doctrines, etc. China Defense.com Articles on the country's modern military history and current armed forces. China Military Guide GlobalSecurity.org Overview of China's military forces, facilities, and equipment. Chinese Military Power Full-text online resources concerning China's military policy, capabilities, and potential. China Military Online sponsored by PLA Daily of the Chinese People's Liberation Army. Military parade for 60th anniversary Pictures of the Military parade for 60th anniversary revolution.